WA’s own Desert Vet, Rick Fenny is a finalist in the 2018 West Australian of the Year Awards on Friday night. We are privileged to support such a dynamic and diverse Western Australian business. All of us at Porters CA wish Rick the very best in the Western Australian of the Year Awards 2018. 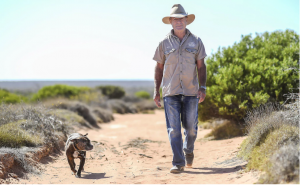 Dr Fenny, who is best known as the real life vet to Red Dog, the kelpie who famously roamed WA’s Pilbara region in the 70s, has been nominated for the Celebrate WA Business Award. The award recognises excellence and outstanding ethics in business leadership, social entrepreneurship and innovation, generating positive social or economic impact in WA. The 69-year-old has dedicated the past 46 years to being a veterinarian and businessman. His company has invested around $50 million in WA to date. Dr Fenny said he was honoured to be a finalist. Through his company Pets + Vets, the Rick Fenny Group has built a network of 11 vet clinics across Western Australia – WA’s first ‘remote-controlled’ network of clinics – including in Karratha, Albany, Kalgoorlie, Mirrabooka, Victoria Park, and South Hedland which have employed hundreds of young vets. Pets+Vets is a wonderful example of identifying business opportunity, pursuing a passion and making a dream become a reality. Pets +Vets clinics in remote towns ensure local residents have access to quality vet services, and often specialist vet services, close to home. “If people don’t have access to everything they need, they won’t live in regional areas so it’s been great to able to play a part in helping these parts of WA flourish,” said Dr Fenny. Rick is a passionate advocate for regional and remote Western Australia. After building his vet empire, his company went on to expand into tourism. His focus on WA tourism has led him to diversify his business operations. Fenny owns and operates the award-winning Ocean Park Aquarium in the World Heritage listed Shark Bay area and Albany’s Maitraya Private Retreat attract Australian and international visitors. “It’s an honour to call WA home and be in a position to share its unique scenery, experiences and creatures – Ocean Park has welcomed about half a million people in the past 10 years and that’s so rewarding to know we’ve shared the marine life of that incredible part of the world with so many,” said Dr Fenny. In line with his passion for promoting WA as a global tourist destination Rick has become WA’s own TV personality vet on Desert Vet which is currently being shown on Qantas flights. The program piloted on Channel 7 last year and plans are afoot for more episodes in the future. Further contributions to WA tourism include Fenny’s sheep and goat station outside of Denham, helping fundraise for the design and building of the statue of Red Dog in Dampier –which has become an iconic tourist destination. They also funded a plaque at Red Dog’s burial site in Cossack. “There’s a continued need to put the spotlight on our amazing state and attract interstate, international and local tourists to regional and remote WA so it’s great I can be a part of that through Desert Vet,” he said. Congratulations Rick on your enormous contribution to business enterprise and tourism in WA. Award winners will be announced at a gala dinner at Crown Towers on Friday 1 June.